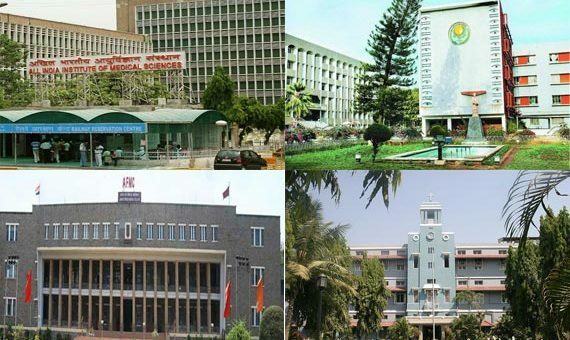 Top Medical Colleges in India 2019 is a comprehensive list of best Medical Colleges in India. These colleges have a reputation in scores, placements and education quality but they are not set in any particular ranking in this article. The National Institutional Ranking Framework had recently announced the ranking for best colleges in India in 8 categories. (NIRF Ranking is one of the most trusted methodologies to choose the best college). The list also contains the ranking of ‘top medical colleges in India’. The parameters for ranking colleges and universities mainly cover five things: Teaching, graduation outcomes, learning resources, outreach and professional practices. Take a look at the top 25 Medical colleges in India. AIIMS New Delhi has been ranked number one once again. The clinical exposures in AIIMS are unmatched. The hospitals treat 3.5 million patients every year. It is known for charging the subsidised tuition fee amount. This medical institute offers various courses like Bachelor of Optometry, Bachelor of Surgery and Bachelor of Medicine. MD/MS( Master of Surgery), M.D.S and MD in Hospital Administration. Apart from these courses, there are many other courses in various streams such as Biochemistry, Anatomy, Physiology, Nursing, Nuclear Medicine Technology etc. For admission into AIIMS, AIIMS entrance exam is conducted in May every year. However, it is very difficult to get admission in this college. Among thousands of aspirants, only about 70 gets into AIIMS. Postgraduate Institute of Medical Education and Research, Chandigarh offers educational, research, medical and training facilities to its students. Apart from Undergraduate and Postgraduate courses, the institute also offers super specialist courses. Besides, it provides quality medical care to a large number of patients on a daily basis. Christian Medical College, Vellore is one of the prominent and oldest medical institutions in India. It was founded in 1900. This private medical college offers specialised undergraduate courses. Bachelor of Occupational Therapy(BOT), Bachelor in Prosthetic & Orthotics( BPO), Bachelor in Audiology & Speech-Language Pathology (BASLP). MBBS, Postgraduate and Diploma courses are also available here. Kasturba Medical College Manipal is a self-financed medical college in Karnataka. It is affiliated with Manipal Academy of Higher Education (Deemed University). The courses offered at KMC, Manipal includes MBBS, M.Sc, MD, M.S., M.CH, PhD, M.Phil and advanced training program. Application to this college takes place on the basis of MBBS NEET Entrance Exam scorecard. King George’s Medical University, Lucknow is one of the renowned institutions Pradesh. It was established in the year 1911 by King George V, the then Prince of Wales. It was formerly known as the Chhatrapati Shahuji Maharaj Medical University. This Medical Institute is known for providing good infrastructure and facility. The college offers both undergraduate courses and postgraduate courses like MBBS, M.D, BDS, MDS. Jawaharlal Institute of Postgraduate Medical Education and Research, Puducherry was founded in the year 1823 and is one of the oldest Govt. medical college. The institute offers undergraduate and postgraduate courses in 37 different disciplines. It also holds a working hospital which provides inexpensive medical treatment to a large number of patients. It is a central government funded institute with autonomy to run its administration. For admission to JIPMER, Puducherry the students have to clear the entrance test conducted by the college. Institute of Medical Sciences Banaras Hindu University is a prestigious Govt medical college in North India. The college was founded in the year 1960. There are undergraduate and postgraduate level courses. The Institute is approved by Medical Council of India(MCI), Government of India. The Institute of Liver and Biliary Sciences, New Delhi is a mono-super speciality hospital for liver and biliary diseases. It was founded in 2009 and was established by the Government of the National capital Territory of Delhi. It has been given the status of deemed university by UGC, India. Institute of Liver and Biliary has a total enrollment of 24. Jawaharlal Nehru Medical College, Aligarh Muslim University was founded in 1962 and is one of the oldest government medical colleges in Uttar Pradesh. The college is a statutory body of Aligarh Muslim Universit. JNMC offers various courses in undergraduate, postgraduate and diploma levels. It is a top medical college in Uttar Pradesh. Sri Ramachandra Medical College and Research Institute is one of the prominent private medical colleges in South India. The medical college is located in a sprawling 175-acre campus. SRMC is affiliated with Sri Ramachandra University (deemed), Chennai. MBBS, MD, MSc, Doctorate of Medicine and Master of Surgery are some of the courses offered by the college. Hamdard Institute of Medical Sciences and Research, New Delhi was established in 1962. It is known for providing quality service and modern facilities to its patients at affordable costs. Besides, HIMSR has highly qualified and devoted teaching staff to provide support to the students. The institute offers various courses at undergraduate, postgraduate and PhD level. M.S Ramaiah Medical College, Bengaluru was established by Shri M.S Ramaiah and the Gokula Education Foundation. It was founded in the year 1979. The courses offered by M. S Ramaiah Medical College include MBBS, MD, BPT, DM, M.S., MPT, M.D (Dermatology), MCH, PhD, PG Diploma. The Medical Institute is affiliated to Rajiv Gandhi University of Health Sciences. Vardhman Mahavir Medical College was established in November 2001 and is attached to the prominent Safdarjung hospital for clinical indoctrinating. It is the largest Delhi Government Hospital with the latest facilities. The medical college is affiliated to Guru Gobind Singh I P University Delhi. It offers excellent infrastructure and the labs are fully equipped. About 25 courses are offered here including undergraduate, postgraduate and speciality courses. They have an intake of more than 700 students per year. Jawaharlal Nehru Medical College, Belgaum was founded in 1963 and is one of the oldest medical colleges in Karnataka. It is a constituent medical school of KLE University. JNMC Belgaum was earlier affiliated to the state unitary Rajiv Gandhi University of Health Sciences. Apart from MBBS and MD, the college offers about 42 courses. JNMC is approved by the Medical Council of India and has 200 seats for MBBS. University College of Medical Sciences, Delhi was established in 1971. This Medical college in Delhi is affiliated with the University of Delhi. UCMS is associated with Guru Teg Bahadur Hospital which serves as the training hospital. The Institute provides modern technological facilities and best service to its patients. MBBS, BDS, MDS, MS, Diploma are the courses offered here. The institute aims at imparting excellent medical teaching as well as healthcare facilities. Kasturba Medical College Mangalore was established by T.M.A Pai in 1953. The college is affiliated with Manipal Academy of Higher Education (Deemed University). New courses, faculty research and student amenities have developed in the college over the years. It is the first college in the private self-financing sector. Undergraduate, postgraduate medical courses, P.G training facilities are offered here. Besides, diplomas in medical sciences and PhD in 6 subjects are provided. The college is clubbed together under the name Kasturba Medical College and share a common entrance exam, chancellor and several facilities like hostel among other things. Panjab University is a public collegiate university located in Chandigarh. It got originated in the year 1822, making it one of the oldest universities in India. The institute offers various courses in different streams. The medical courses include BDS, BHMS, MBBS, MD, B.Pharm, M.Pharm, MSc etc. Admission to the college is based on entrance exams conducted by the University. Panjab University is approved by the All India Council of Technical Education (AICTE) and is accredited by National Assessment and Accreditation Council (NAAC). PU is associated with the Association of Indian Universities (AIU). Dr D.Y Patil Medical College Pune is the first private medical college of Maharashtra and is situated in Pimpri, Pune. It was found in 1996. The courses offered at Dr D.Y Patil Medical college includes MBBS, M.S., MCH, DM, Diploma in Tuberculosis, M.D. and PhD. Mahatma Gandhi Medical College and Research Institute are one of the leading medical colleges and hospital located in Puducherry. It was established in the year 2001. MGMCRI is affiliated with Shri Balaji Vidyapeeth (deemed university). The medical college offers an amicable and academically challenging environment with high teaching quality, state-of-the-art study and treatment facilities. It offers undergraduate, postgraduate and diploma courses in various disciplines at affordable fee structure. Kalinga Institute of Industrial technology, or otherwise known as KIIT is an autonomous university established in 1992. KIIT is approved by All India Council For Technical Education( AICTE) New Delhi and Bar Council Of India. Kalinga Institute of Medical Sciences (KIMS) is the medical school of KIIT. MBBS courses and medical stream courses were started in 2007. It has a sister institute offering dental courses called the Kalinga Institute of Dental Sciences. The institute is an eco-friendly campus and has a working hospital. PSG Institute of Medical Sciences and Research is located in Coimbatore. It was founded in the year 1985 and is run by P.S Govindaswamy Naidu and son’s charities. PSG Institute of Medical sciences is the first teaching hospital in Tamilnadu providing modern education with good infrastructure. The institute offers various full-time courses at undergraduate and postgraduate level. The college is affiliated with the Tamilnadu Dr MGR Medical University, Chennai. SRM Medical College Hospital and Research Centre were established in 2004. It is an associate institute of the SRM group. SRM MCHRC offers undergraduate, postgraduate and MBBS courses in medical streams.